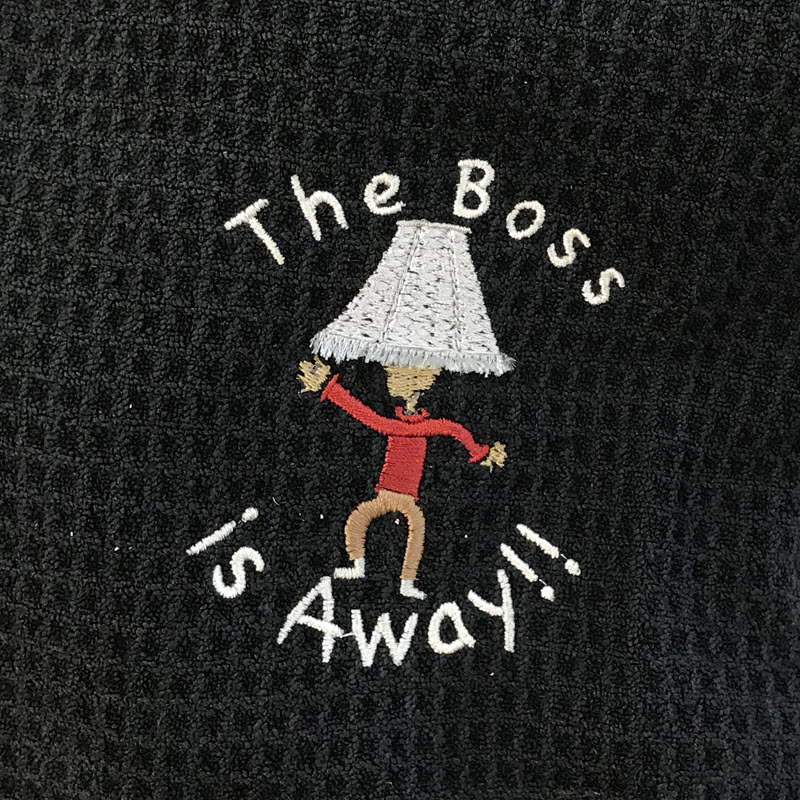 Yes, this started as a little bit of a joke when Brian went on vacation, but after digitizing and sewing it out, I just had to put this on a golf towel. 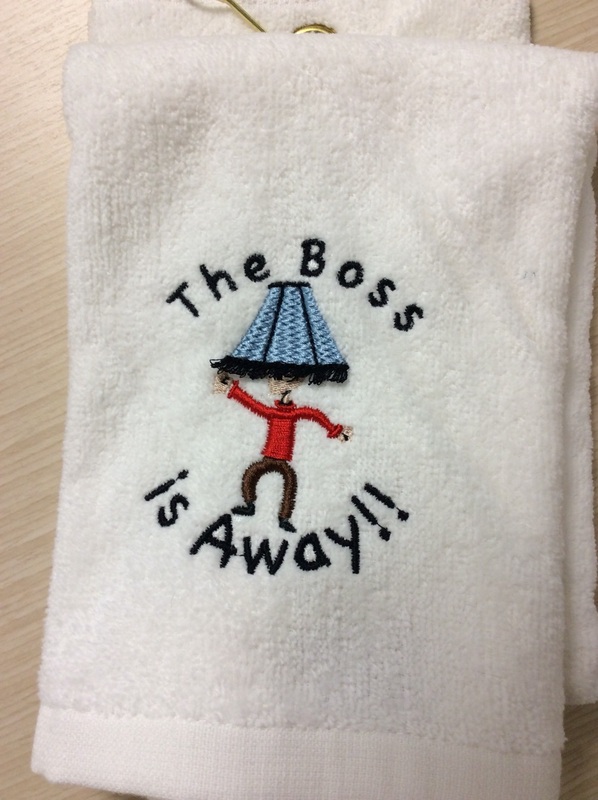 I decided that “The Boss” has a lot of different meanings. I digitized this design using StitchArtist Level 2, and the font is called Elementary from Font Collection 1. This file is saved in the .be format so feel free to make changes, add different letters or both. This design uses several different digitizing techniques including running stitches, fills, satin stitches and even fringe. All of these different techniques can be found in the StitchArtist Level 2 program. I used the Baby Lock Valiant, but you can use almost any machine to sew out this design, as long as your machine uses a 100 X 100 mm (4 inch X 4 inch) hoop or larger. 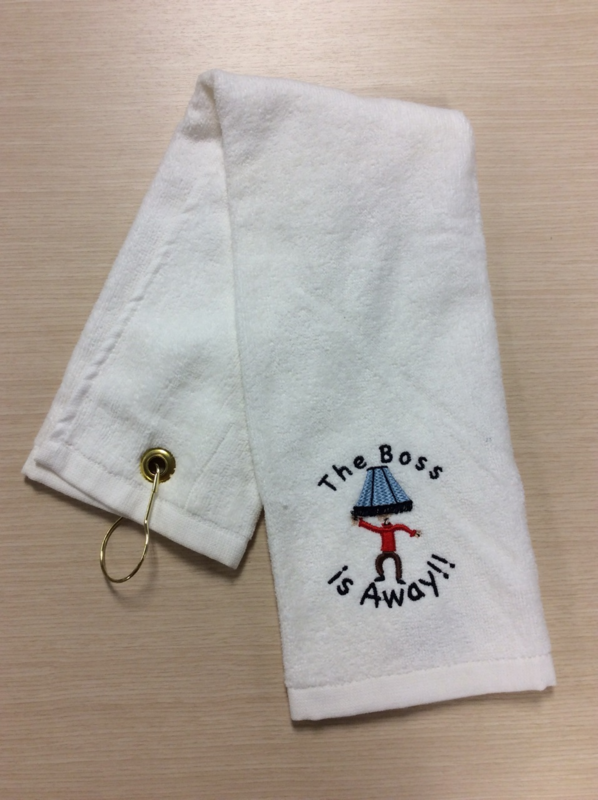 I used a Golf Towel I got from Target and 1 layer of tear away stabilizer. Now, this design does have some fringe in it. You can choose to sew the fringe or not. If you decide to leave it off, you can just skip the last color before the letters. The design does have a small column stitch under the fringe so that the design will look good if you leave off the fringe. What you will need is a good pair of sharp scissors with a sharp point. There are two ways to cut the fringe. First, you can cut the top stitch (this is what I did). To do this, just cut the stitches as low as possible by carefully working the tip of the scissors into the satin stitch. Just keep working down the satin stitch until you get to the opposite side. Then turn the design over and using the tip of the scissors work the bobbin thread loose. You can then cut the bobbin thread to smooth the back of the design. Second, you can cut the bobbin thread. To do this just cut the bobbin thread in the middle (try not to cut the top thread). Turn the design over and carefully pull up the top thread. This will give you loops. I hope you enjoy the design! Posted 9 months ago at 1:42 pm.